It has been said that tools are more than a function of their use, rather, they in turn reshape the minds who use them (Alan Kay). It has also been said that our tools have become an extension of our collective nervous system, (Marshall McLuhan). And finally, it has been said that all of us who are active participants in the Network are always in a potential state of global embrace (Roy Ascott). For those of us who have come to inhabit the third space, perhaps to a greater degree than we care to admit, the notion of how our technological tools have reshaped us, extended us, as far as the Net can reach, is fundamental to our understanding of what is implied by the post-human condition. For in the third space, where boundaries are blurred, connections are instantaneous, and everyone is just a click away, we have to wonder, and quite critically so, how this is effecting what we consider to be our innately human qualities. What does it mean to be human in the first place? That is a question perhaps too large to be answered by any one mortal soul. But if being human means we occupy space, exist in time, create relationships with others, nourish ourselves physically and intellectually: well all of those human necessities have been irrevocably altered by our exposure to technologies and our increasing immersion in the third space. 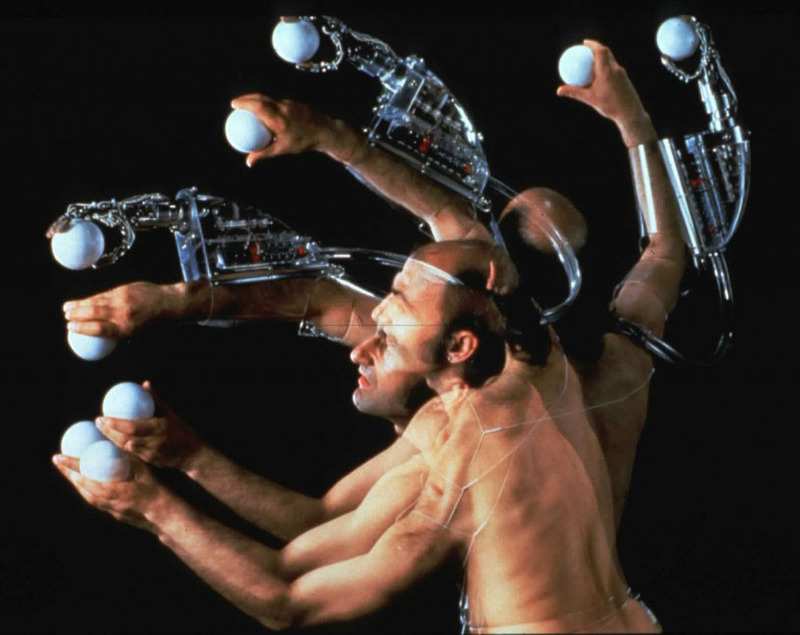 In the photo above of the Australian performance artist Stelarc, we are viewing a graphic realization of technology as an extension of man. We see Stelarc’s prosthetic third arm in rotation and flailing like a contemporary version of a multi-limbed Hindu goddess. Stelarc has taken the extension of technology quite literally, situating his body as a physical object in an active network of information signals and gestural response. This is perhaps what it means to be post-human: an accumulation of limbs, action, meaning and connectivity that transgresses the limitations of how an individual occupies space and time: we are everywhere at once, simultaneously and instantaneously. That is what it means to be post-human in the 21st century. Perhaps this notion of the post-human is relative: merely a question of evolution. Perhaps we have always been post-human since the days of prehistoric caves, when the first tools were designed to capture food and fend off warring tribes. In the 21st century, even our weapons are situated in the third space: our drones, our tele-commandos, our missile systems, and our tele-present robots are all designed to extend the human reach via the network, for better or for worse. In this extension of our being, whether in art or in war (the Futurists understood this dichotomy), we are no longer satisfied with occupying a singular moment or place in time. It is no longer enough to just sit in a café, or take a walk, or even take a leisurely drive: we are always connected, tethered, tied to the network, or as William Gibson originally described, jacked-in. We all wield, in a way, a prosthetic third arm in the form of a personal computer or a mobile device. We often find ourselves grasping for these devices, sometimes unconsciously, waiting for the next pulsation or beep to announce an incoming message or a user in the system. Yes, in this age of connectivity, there is no longer any doubt we are all cyborgs, for without our metaphoric prosthetic limb we are lost, disconnected from the next text or phone call. Without a prosthetic limb that extends our sense of belonging – even becoming in the third space – we feel alienated, separated, from humanity’s teeming, networked activity. Well, perhaps for the sake of argument, this could be construed as a bit of an overstatement, but not for everyone: particularly the digital natives. While older generations are in various states of third space habitation – some even defiantly and boldly have disconnected themselves – the digital natives for the most part no longer even make the distinction between the first and the second and the third spaces. They are linked to their connections like a babe to a mother’s breast, they have never known any other reality, their extensions are permanently ingrained and instinctive. So the question then becomes, are the digital natives post-human or is this what it means to be human today? Is it only we as previous generations of users who view the digital natives as post-human? Is being cyborg de rigor (and normal) in contemporary life? I’m sure Stelarc would say he was never post-human, but then again, perhaps we have lost sight of what it means to be human in an age where psychological and social transformation is accelerating at such a frightening pace. Alvin Toffler predicted this acceleration in Future Shock some forty years ago. It seems we are moving at such blinding speed in today’s technological culture that it may no longer be impossible to even determine what it means to be human.